Did you guys watch last night? What did you think? I was underwhelmed. I watched the Red Carpet on E!, then Bey and Lorde perform....then it lost me. Snooze fest. And Downton was calling, so I answered! I also thought the Red Carpet was kinda boring as well. Many of my favorites to watch....Beyonce, Rihana, Lady Gaga - three powerhouses who always know how to make an entrance were not there. And I really only liked one dress. One dress, how during award season is that possible?!?! Any who, I really liked Rita Ora's Lavin dress. I thought it was perfectly Grammy's. Funky, off-beat, but very glam! Maybe because I could see myself wearing it. Now your turn, what did you think of the show? Of the Fashion? SPILL in comments, I want to hear! Winter is in full force, I'm not complaining (swear)! But all my online shopping...err, online window shopping are items to be worn in temps about 70-80 degrees warmer than it is right now.... which is a whopping 4 degrees! 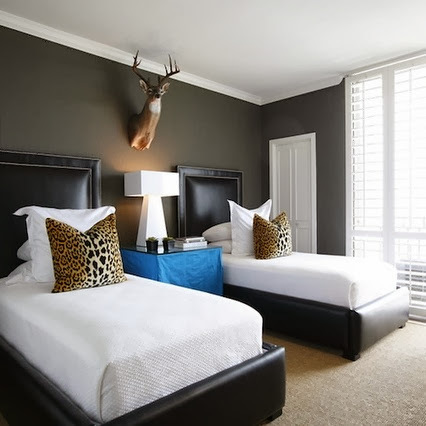 Time to start planning a winter escape! 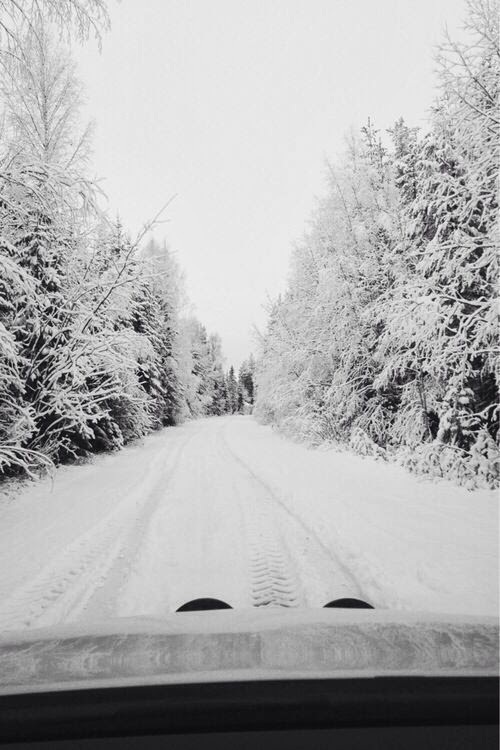 Who has a winter escape planned???!?!?! Where are you going? The Hubs and I are thinking a quick escape to Mexico, sun, sand, endless guac & margaritas!!! 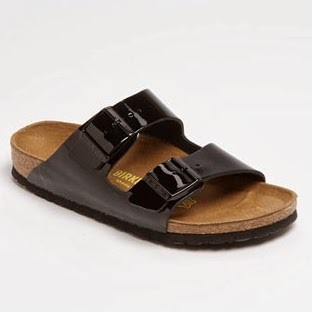 What are your thoughts on....Birkenstock's?! 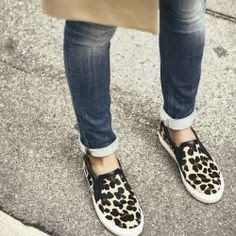 ....I want to hate them, but a giant a$$ part of me is dying for a pair! I know they tried to come back last year. I was all, ewwww, but now I'm like hey, comfortable is a hell of a good place to be! Ripped up shorts, oversized T, birk's - might be my summer uniform! 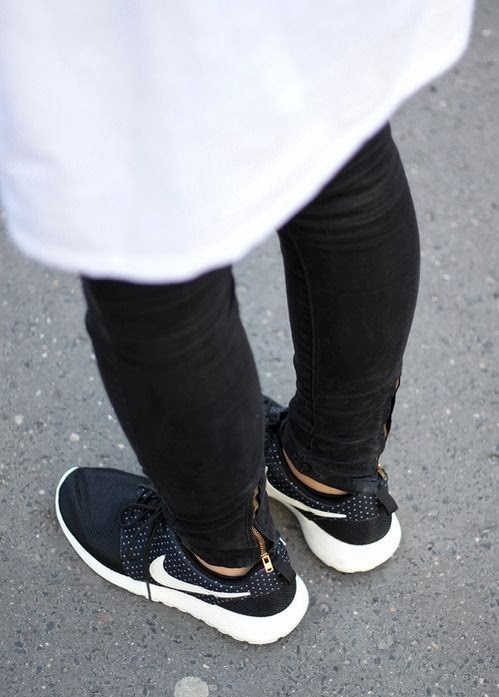 Love the patent leather! What do you think? Dish it, in the comments! Sometimes things are worth repeating. Over and Over! Currently I've had a little line-up of items that 'heavy rotation' barely begins to describe it! LOL Hey if it ain't broke don't fix it! :) Lately all of these item's have been on repeat in some form or fashion. 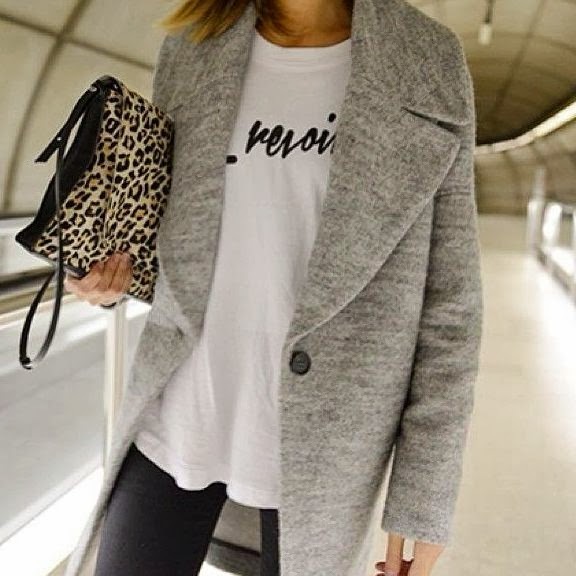 What have you been wearing, reading and or repeating a lot lately? 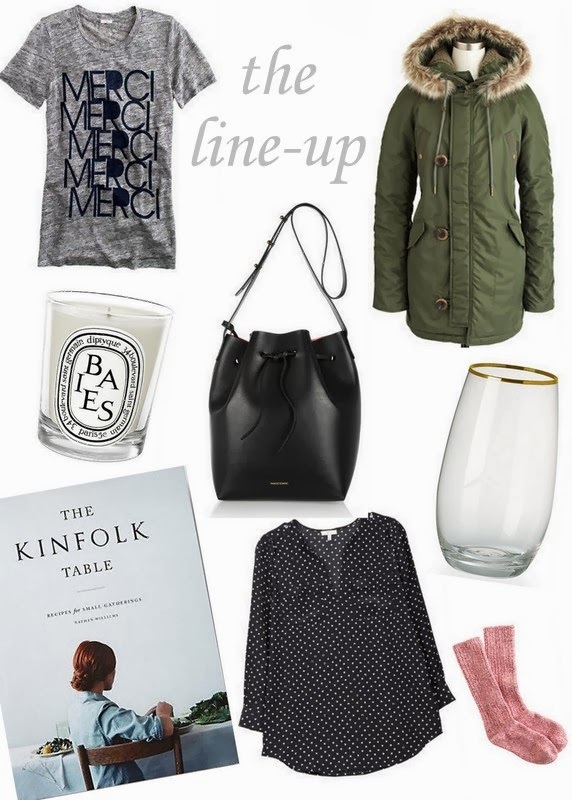 Silk Shirt, Jeans // Cozy Socks, Sweat Pants // New recipes, bottle of wine // exploring and shopping in new 'hoods // couch, comfy T, lit candles // playing in the snow .....Now, your turn! You guys it's been just miserably cold up here. Womp, womp. We are talking windchill temperatures of -40F, MINUS FORTY! This is the first time my poor southern California raised bones have ever experienced anything like this! Ultimately it is what it is, complaining can't change to the outside temperatures, however you need to be safe if you venture out! Layer, on layer, on layer - yesterday I wore tights under my pants, 3 pairs of socks and just as many tops & then a thick sweater! :) Just can't not do it... frostbite is real! 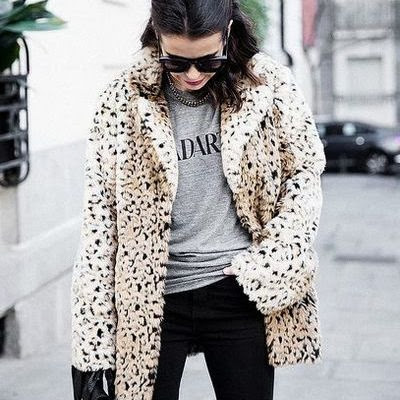 I know not everyone lives where the temps are this extreme, but it needs to be known the gorgeous street-style photos, blogger outfit posts of "this is what I wear wear in the winter" aren't real or realistic (like above, which I love & would wear in a heartbeat!). 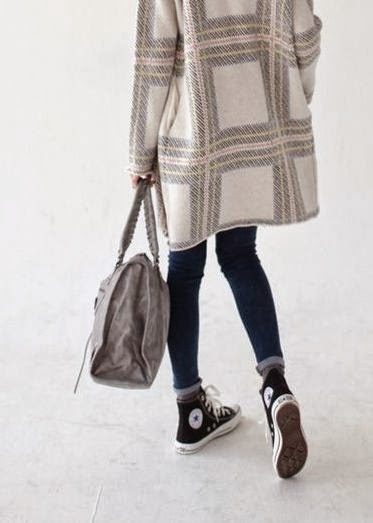 I'm sorry but (even in mid 30 temps) you don't walk around with your coat draped over your shoulders, wide open, gloveless or shoes/booties without socks! You might in the lower half of the country but not up north! You can't! It's a a smoke and mirrors situation - I get it, you can see the sweater or cute tops underneath, but they are staged. If you are in my camp, you might even say goodbye to caring what goes with what, because warmth is key! I just hope you all know that, and if you didn't realize I apologize for bursting your bubble. But don't worry getting dressed for winter isn't the worst thing in the world. I actually enjoy it! 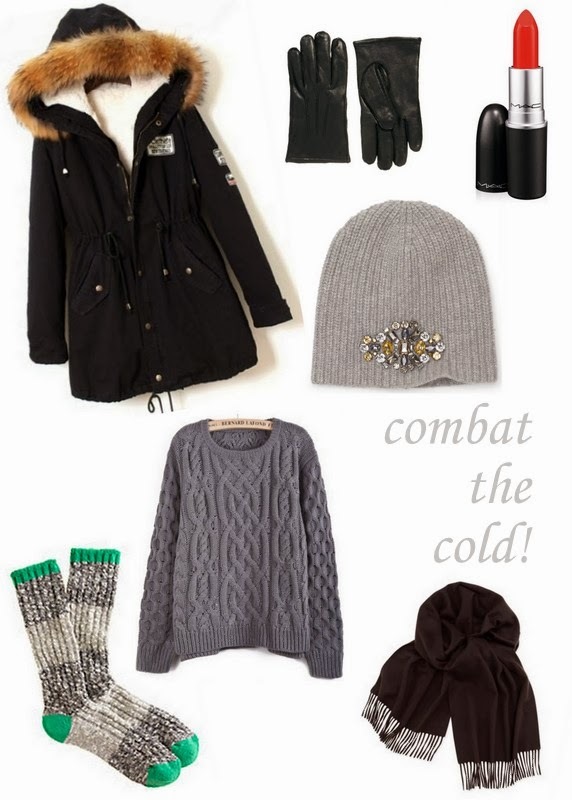 How have you been combating the cold? What are your tricks? 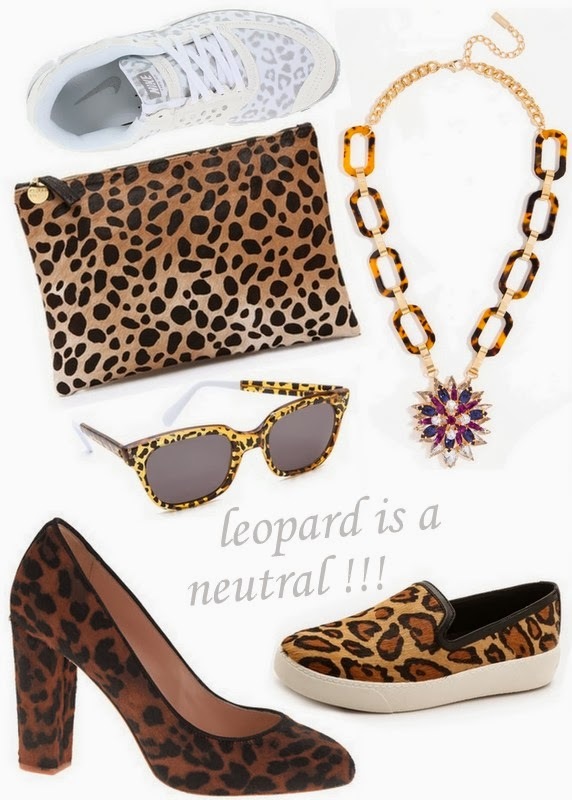 Here are a few layered combos, with items I love, to inspire you! I know Jenna. I know! Some days I find myself searching for the right shoe to wear to work. The right belt to wear with my slacks. Or the right shoe to wear out to brunch. Given the outfit sometimes it's hard! Do I wear black with this? or brown? tan? gray? 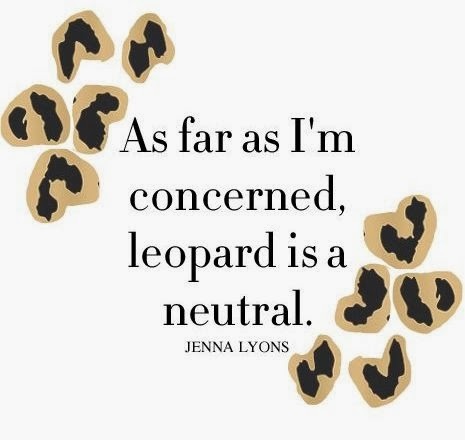 More often than not I find myself reaching for a leopard/cheetah print to put on. They just always seem to go. And go so dang well! Whether it is at home, on your body or in your hands....it always goes!!!!!! ** If you live in Chicago or the Midwest PLEASE STAY SAFE AND WARM!!!!!! I trekked to work today and regretted every second, this girl is not cute out for -40! yes, MINUS FORTY windchills!!! BARF! Happy New Year friends!!!! Time to start anew, start fresh and time to tackle another year! Taylor and hats don't always get along, it's the curly hair (most days) but this snow! THIS SNOW! 50 hours of straight snow..... at my house we have at least 12 inches of new fluffy snow! So while I've been 'snowed' in...I got inspired to embrace the beanie! I thought go big and splashy or go home! 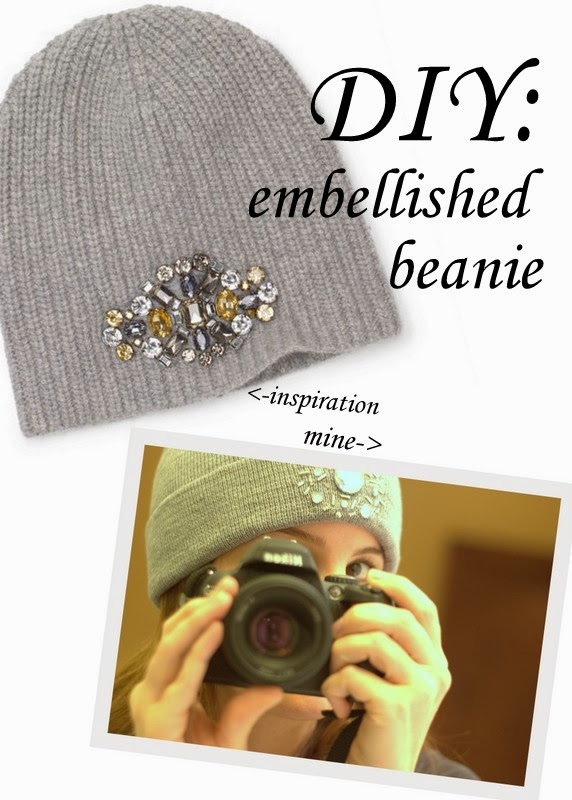 Recalling the sweetest embellished beanie at Club Monaco a few weeks ago, and I gave a go at my own version. So enter a cold snowy day (or just about an hour of relaxation and crafty good times!) & you have a very easy and fun DIY! 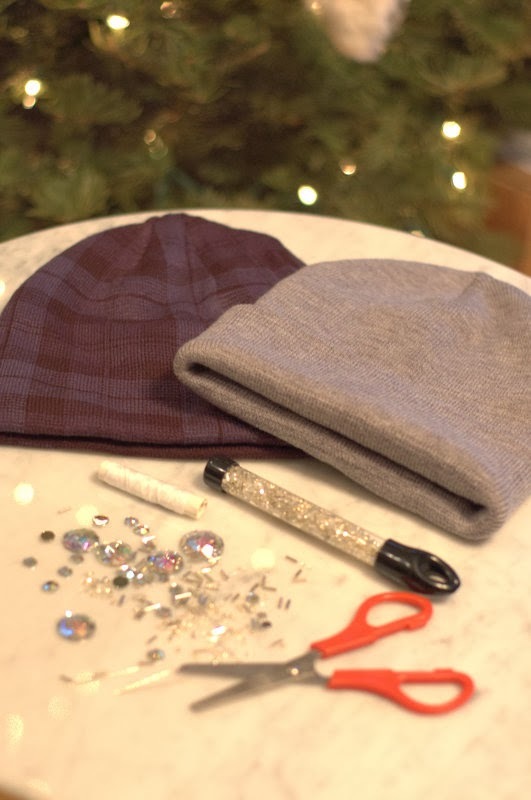 You will need a beanie, I chose plain gray and muted plaid. Sequins, beads, needle & thread. 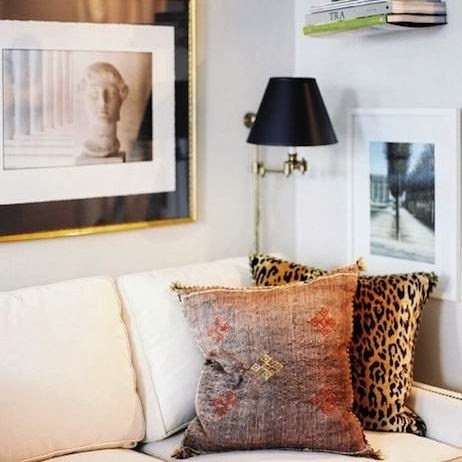 A good TV show, a little time and some inspiration! I started by mapping out the 'distance' across my forehead I wanted the embellishment to be. I used 2 straight pins to mark the distance for a guide. 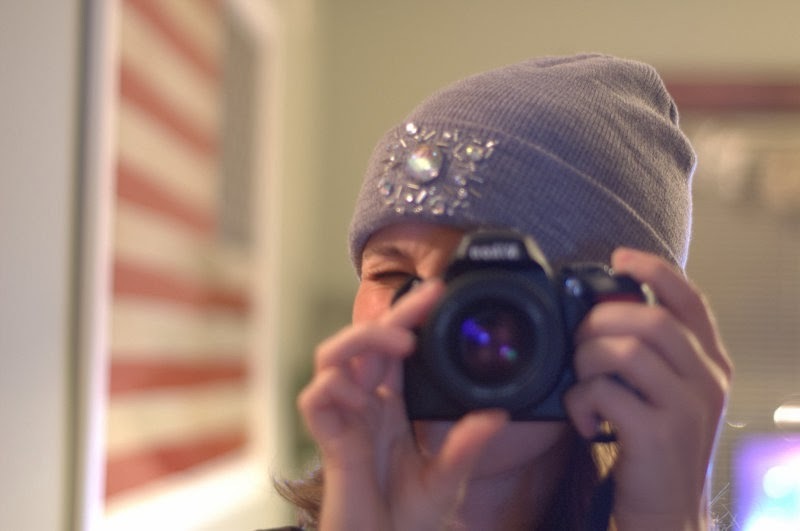 Then I flipped the beanie inside out. Since mine had a fold up at the front, this will make it easier to sew the beads and get a flat surface to layout your design. 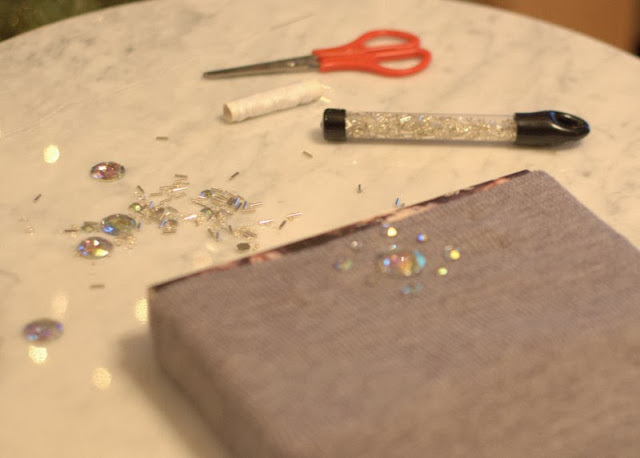 Now start laying out your sparkle. Do you want starburst? or more linear? Lay them out and have some fun! 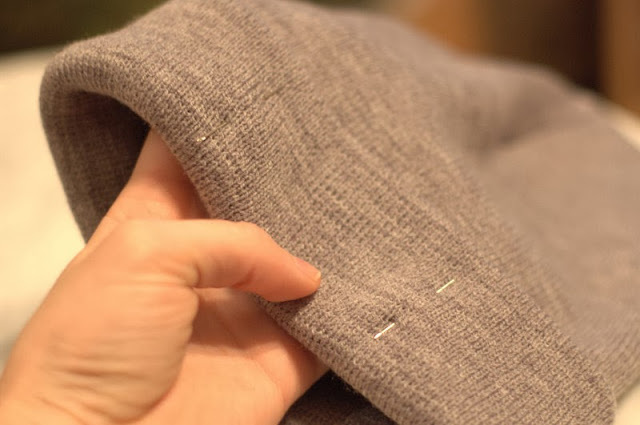 Once you find the sparkle you like, start sewing or glueing depending on the type you have. I started with the larger sequins and then started sewing at random with various smaller sizes and shapes. Et voila!!!! I love it, I've been wearing it mith my PJ's for two days.....a better picture once I dig out! 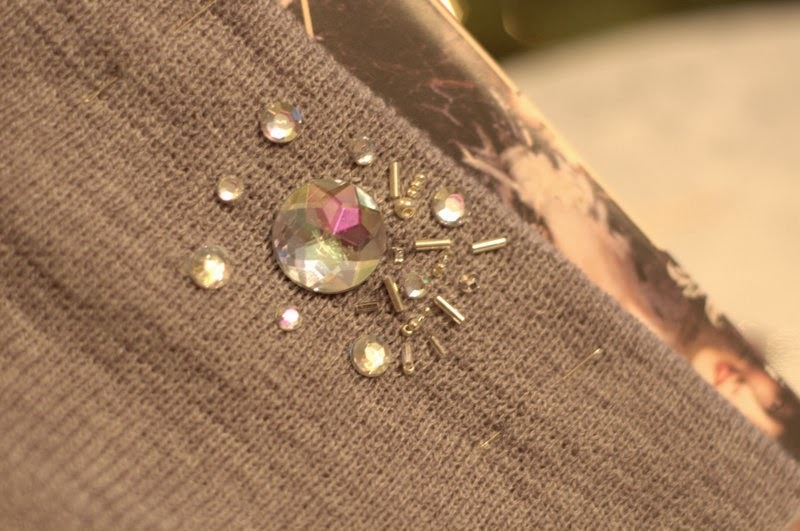 Here are a bunch of other embellished cuties if sewing isn't up your alley! But I say try!